I visited my parent's house this week, and my boyfriend also came along. He wanted a key lime pie, but my parent's oven is broken. They have a small convection oven, but a 9" pie pan will not fit in it. That's how small it is. 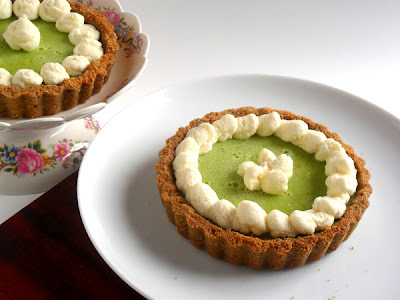 I came up with the solution to make key lime pie tartlets instead. I used four 4.75" tart pans. They taste exactly the same as a real key lime pie, but it's in individual snack size! Stir graham cracker crumbs, sugar, and butter together until well combined. Press mixture evenly onto bottom and up side of each tartlet pan. Bake crust for 10 minutes and allow to cool on a rack. Leave oven on. To make filling, whisk together condensed milk and yolks until well combined. Add in the lime juice and whisk all together. Pour filling into each tart crust, and bake for 15 minutes. Cool the pie completely, and refrigerate. Before serving, whisk the heavy cream until stiff peaks form. Add in powdered sugar and whisk until well combined. Serve on top of each key lime tart. The finished key lime pie tarts with hand whipped whip cream. The parents also don't have piping bags, I piped it by making a piping bag with parchment paper. These are too beautiful to eat but I'm sure I could talk myself into it. I've got perfect tart pans and all the ingredients. Nuff said, off to cook! Yummy recipe. If I use 3" tart pans should I change the bake time?